I mean, you can’t even leave your house anymore without fear of being assaulted, robbed, or worse. If you don’t believe me, just turn on the teevee news. I dare you. Chances are there’s a pretty girl missing … somewhere. There’s likely also an unexplained (at least to us) home invasion of some sort that just happened (BREAKING NOW!) in a town we heard of once. Maybe we drove past the exit on that trip to the national park. And the murders. No matter what city broadcasts your news, I am betting murders are way up. If they’re not, it’s only because somebody forgot to count the killings in the outlying counties, which only goes to prove that we live in very dangerous times. I have told this story before, but several years ago, when I was new parent, a very kind and well meaning woman urgently offered me a newspaper clipping that listed the 10 Things In Your House That Are Most Likely To Choke Your Child. It’s important to note that this was in a room filled with other relatively new parents and that I, as the recent arrival, had missed a good deal of the preliminary discussion. Several already had sworn to themselves and their peers that all grapes would be halved, all hot dogs would be sliced on the vertical axis, and – it goes without saying – all jellybeans shall be kept out of the reach of small children. So when I casually thanked by volunteer benefactor, I was met with a certain amount of disdain. Generally your state of last residence picks up the tab for that kind of accommodation. Fear is a dominant narrative. So I was encouraged last year when Lenore Skenazy, a syndicated columnist writing in New York, described how she had challenged her 9-year-old son to find his way through the wilds of Manhattan using public transportation. Still, I saw it coming. She was pilloried in LTEs and by commenters on the newspaper sites where her column appeared. It was clear to one and all that she was a very bad, bad mother who had put her child at risk to advance her own agenda, lifestyle, whatever. The recurring theme in many of these responses was that no matter the author’s experience as a child a generation ago, things are much different now. We do, of course, live in very dangerous times. Thankfully, Ms. Skenazy, whom I do not know, has refused to yield. 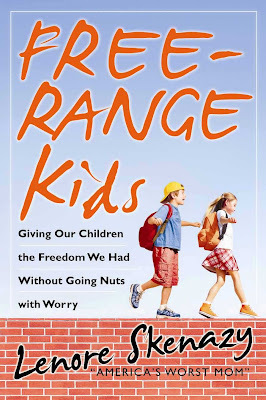 In her new book Free Range Kids she breaks down not only the philosophy of raising children who become adults capable of taking care of themselves, but she uses real numbers to do it. Do we really have to worry about the bogey man 24/7? Or, can we accept that when more of us go to that park because we’re not afraid, there is by definition less to be afraid of?